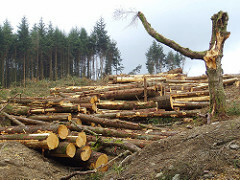 Forestry Offsets: Dubious But Still Necessary? There's no question deforestation is responsible for a sizeable chunk of the world’s carbon emissions. But it's difficult to figure out how best to use offsets under a cap-and-trade regime to prevent people from cutting down trees. Say a Brazilian landowner is paid, via offsets, not to cut down his forests. The maddening question is what would have happened without those offsets? If the owner would have, in fact, chopped down the trees, then the offsets have created a real reduction in emissions. But what if the owner was just planning to leave the trees alone? In that case, the owner is earning money for nothing, and those credits are giving somebody else the right to emit real pollution. Still, the alternative to an offset program could be far worse. A recent paper in Science attempted to model the changes to global land-use as a result of different types of international climate regimes. Under a system that does allow forest owners to earn carbon credits for preserving their trees, land-use patterns would stay fairly similar to what they are right now. On the other hand, if there’s a system that penalizes the use of fossil fuels without allowing polluters to earn credits for forest preservation, then the model expects that nearly all the world’s forests would be cleared and put to use growing biofuel crops. This would be an incredibly perverse outcome, and it’s doubtful that the world’s governments would tolerate near-complete deforestation as a consequence of their climate policies. But as the Science paper shows, there's a real danger inherent in any climate treaty—or domestic climate bill—that doesn’t take into account all sources of greenhouse gases. Clearing forests to plant biofuel crops makes almost no sense: The emissions from deforestation almost fully negate the benefits of using those biofuels to replace fossil energy. Yet if fossil-fuel emissions are the only emissions that legally count, that’s exactly what could happen.